The saddest story in the Torah is that of Rochel Imeinu. Whenever I read it, or hear about it, I just want to cry and cry for her. She was a wonderful girl, did everything right, and yet her life was one hardship after another. When I read about her trials and tribulations, I get so angry on her behalf. She didn’t deserve it. It doesn’t seem fair. To start off, she met the love of her life and was told to wait 7 years to marry him. Then her despicable father made her sister go in her stead when she was about to walk down the aisle. Rochel was so good and so kind, and she cared about her sister so much, that she taught her the signs which she and Yaakov had made up so that this very thing wouldn’t happen. As Lavan laughed, Rochel had to submit. Finally, she married Yaakov as well, but now she was the second wife. As Leah had one son after another, Rochel was barren. The pain she must have felt was immeasurable. Many years later, she had her two boys: Yoseif and Binyamin. Two boys versus her sister’s six. But she felt blessed. And she felt happy. But the suffering didn’t end there. When Yaakov and his family were leaving Lavan’s house, Rochel took her father’s idols, in her pure desire to protect him and help him head down a straight path. She didn’t know what her decree would be. Because of this, instead of getting rewarded, Rochel was punished with death. She died in childbirth. She met her son, but never got to raise him. She tried to name him Ben-Oni (The Son of My Mourning), but Yaakov changed the name to Binyamin (The Son of My Strength). Since Yoseif was only 8 years old when Rochel died, she didn’t even get to enjoy being a mother for that long. She was buried on the side of a road. 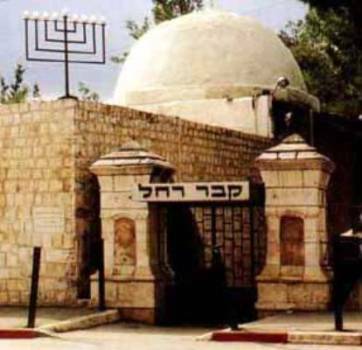 She wasn’t buried along with her chashuv family members in Ma’aras Hamachpeila. She was buried in a rush, cast aside, on the way to Efrat. Later on, her motherless children were abused by Leah’s sons, and she was not able to be there for them, to defend them, and to save them. All she could do was daven for them from Heaven. It breaks my heart to think about Rochel. She had a terrible childhood, growing up with a rasha like Lavan. She had to wait years to become married, and by the time it happened, she was not the only one; her sister was there right alongside her, competing for Yaakov’s attention. The woman yearned for children for so long, before finally having 2 boys. And then she died young. Although Yaakov was a good father to his bnei zekunim, and loved them very much, nothing can replace a mother’s love. When you read the story, it is a tragedy. And yet, Rochel is the one who inspires me the most. She taps into a part of my soul that is activated by sorrow and pain. I can relate to her. Her life was a mess too. Her life was labyrinth of unanswered questions, and the very definition of galus. And yet, I feel that Rochel, who suffered the most, was the least recognized for her strength, bravery, and unfaltering faith in G-d, Whose plan she didn’t always understand. She was the first unsung hero in the Jewish nation. And unsung heroes are very rare these days. People today want to be recognized for everything and anything that they do. Giving tzedakah means having our name on a building. Organizing a chessed event means putting our name on the flyer. And if our name is not on that flyer, how angry do we get?! People smile brightly into the camera lens as their picture is being taken when they host a brunch, or a dinner, or a fundraiser to help the needy, the sick, or the underprivileged. Social media has turned this world into a song sung for every hero there ever was. Recently, I have noticed that every single person who had saved anyone in the Holocaust is now featured in Facebook videos. Or every person who has survived, was part of an uprising, or did anything remotely heroic during the war, is now featured in videos and loud proclamations about how amazing they were and how we have to celebrate their last years on this earth. The ironic thing is that these people have been quiet and unsung for the past 50/60 years. They didn’t want to discuss this part of their lives; they wanted to forget it. All of a sudden, we care so much about the amount of likes and comments and shares that we force these people into speaking about the horrifying acts that they witnessed and the terrible war they survived. They look uncomfortable, with their forced smiles, and they try so hard to be the lively speakers that flood social media today. You can see that they are seated just so, with the photographs of their children and grandchildren visible in the background, their makeup done just right to make them look more youthful, and the lighting a little rustic, because they are survivors, after all. Unsung heroes don’t exist anymore. They stopped existing the minute the internet blew up. When I went to seminary, along with my entire class from my Bais Yaakov high school, I was a fish out of water. I am a baalas teshuva and my mother didn’t have the $20,000 to pay. Not only did she not have this abnormal amount of money, even if she had had it, she would have refused to give it to me because she wanted me to go to college instead. The thought of going to a mixed college class made me want to bang my head against the wall, so I forged on with completing the application and going to the interview all on my own. I sat in front of my future principal and told him my story. I was able to read some of the material that he presented me with, and we got through the paragraph slowly, together. A few weeks later I got my acceptance letter. I was going to seminary! But then, when the money and the various deposits were not coming in, my future principal called my mom to see what was going on. When she got her hands on the phone with my poor, unsuspecting principal, she unleashed her fury right out on him. Something to the tune of, “You’re stealing my daughter; you are taking her to a dangerous place, and G-d should curse you with the worst curses EVER, and you should ROT IN…!!! !” was said, or rather yelled, into the dumbfounded ears of my dear, innocent principal. He quickly apologized and hung up, ever so gently. After realizing exactly what was going on, he called my high school. I was summoned to the phone from class. I thanked him profusely and returned to my classroom. All was good. I was going to seminary without a dime to my name. That year in Meohr changed the course of my life. I, a baalas teshuva, now rubbed shoulders with the most elite frum from birth girls from all around the world. These girls had money, they had yichus, or both. As I worked hard to blend in, I always wondered about the money. But the person who paid for me, or maybe the person who let me come for free, would remain unnamed and unknown forever. I emailed Rabbi Greenwald recently to ask him who I should thank. I was brave enough to ask because finally, I wasn’t so vulnerable anymore. He told me he forgot. But I think that my unsung hero went to his grave never uttering a word about the mitzvah that he did. A very wealthy person, or a very well-known person, who wrote a check so quietly that neither I nor the rest of the world will ever even know. This is the definition of a true tzaddik. He didn’t get any accolades for helping a girl he never met, changing her life with the scribble of a pen. This is the definition of chessed. Recently, I decided to dip my foot into the pool of chessed. I was going to be the hero of the day, the one to be relied upon, the praised person at the end of the event. But Hashem had other ideas for me. I was in charge of dessert, tablecloths, challah, flowers, and setting up. This, in my 2019 mind was perfect: they were going to love me and thank me endlessly! So, I set out to get the flowers. With a 4 year old being dragged behind me, holding onto my skirt, I schlepped the flowers to the hostess’s house. With water dripping everywhere, I begged her to spray the flowers daily so that they wouldn’t wilt. Next was the tablecloth gemach. I drove there with a friend, and we were in a rush. “Park here,” she instructed. I parked in the lady’s driveway…only it wasn’t the lady’s driveway. It was her evil neighbor’s driveway. He came out screaming at top of his lungs, and we got so scared that we quickly moved. “He has a gun, you know,” said the gemach lady casually, as I told her what happened. When it came time for me to pick out the tablecloths, I was told to get black, but every black tablecloth that I picked out was unavailable. The only one they had was black and silver. So I took that one, and as soon as I posted it on the event chat, the others said, “No good. We’re not using it. We needed black.” So here I was, lucky to be alive, with the wrong tablecloths in my trunk. And the return date was not until next week! Next came the dessert. I bought all the ingredients and laid them out on the table. As I was mixing the thick cookie dough, my hand mixer broke. I threw it into the garbage and finished by hand. When I went to pick up the challah, it was so tiny, and it was egg challah, which I hate! But it was a special order so there was no turning back. At this point, all of us were completely stressed out and I was fuming. How dare they not use my tablecloths, I thought. At least the flowers are still alive. When I came to the event, I was not speaking to half of the people there. They had gotten different tablecloths—the black they had always dreamed of. They had gotten challah made by a friend of ours which way outshone the pathetic crumbs that I had gone to pick up that day. And as the event was coming to a close, they forgot to serve my dessert!! A few minutes later, when people already had their coats on, my dessert came out. It happens to have been delicious, and they warmed it up just right so that everybody sent praise my way, but by that point, I was so over it, and I never wanted to get involved again. Now, I sit back and I laugh. The drooping flowers. The man with the gun. The wrong-colored tablecloths. The pathetic challah rolls. The dessert that broke my hand mixer and almost didn’t get served…it was all just a reminder that we should be doing chessed for the sake of chessed itself, and not for the accolades. Not for the praise. Just like Rochel Imeinu is my guiding light, and just like the wealthy man who sent me to seminary, so too should I be the helping hand that is truly there to help…not to be sung about. Let this be the start of my path to being the unsung hero.